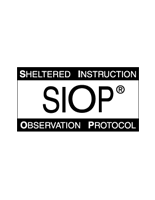 Developed by Dr. Jana Echevarría, Dr. MaryEllen Vogt, and Dr. Deborah Short, SIOP® is the only scientifically validated model of sheltered instruction and a proven framework for teaching both academic content and language skills in ways that are more effective for English learners. As a framework for organizing instruction, the SIOP® Model includes many features that are characteristic of high-quality instruction for all students, such as cooperative learning, reading comprehension strategy instruction, and differentiated instruction. More than 450,000 educators in U.S. schools are using the SIOP Model. Pearson’s SIOP Model professional development uses certified SIOP trainers to help educators learn the SIOP Model, implement it in their classrooms, build capacity throughout the district, and improve academic results for English learners and all students.